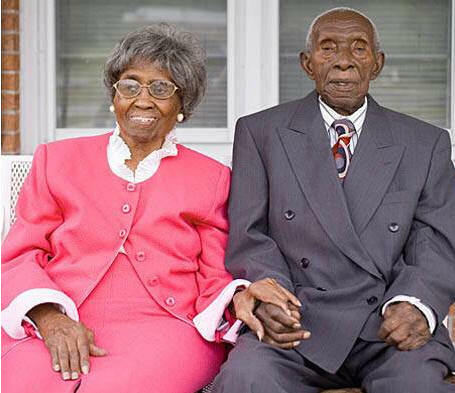 Update: Both lived to the age of 105. Mr. Herbert lived on Earth until February 27, 2011 at the age of 105.. Questions From Marriage Wisdom . . .
H & Z: With each day that passed, our relationship was more solid and secure. Divorce was NEVER an option or even a thought. * Respect, support & communicate with each other; Be faithful, honest and true; and Love each other with ALL of your heart. Zelmyra: A hard worker and good provider. The 1920s were hard, but Herbert wanted to and provided the best for us. I married a good man! What is your best Valentine’s Day memory? Zelmyra: I cook dinner EVERY day. Herbert left work early and surprised me--he cooked dinner for me! He is a VERY good cook! Herbert: I said that I was going to cook dinner for her and she could relax. The look on her face and clean plate made my day! You got married very young--how did you both manage to grow as individuals yet not grow apart as a couple? The children are grown, so we talk more now. We can enjoy our time on the porch or our rocking chairs--together. Herbert: We were apart for 2 months when "Z" was hospitalized with our 5th child . It was the most difficult time of my life. Zelmyra’s mother helped me with the house and the other children; otherwise, I would have lost my mind. Remember marriage is not a contest--never keep a score. God has put the two of you together on the same team to win! NEVER physically! Agree that it’s okay to disagree, and fight for what really matters. Learn to bend--not break!